Shawler is a graduate student at the Virginia Institute of Marine Science (VIMS) and a Virginia Sea Grant Graduate Research Fellow. 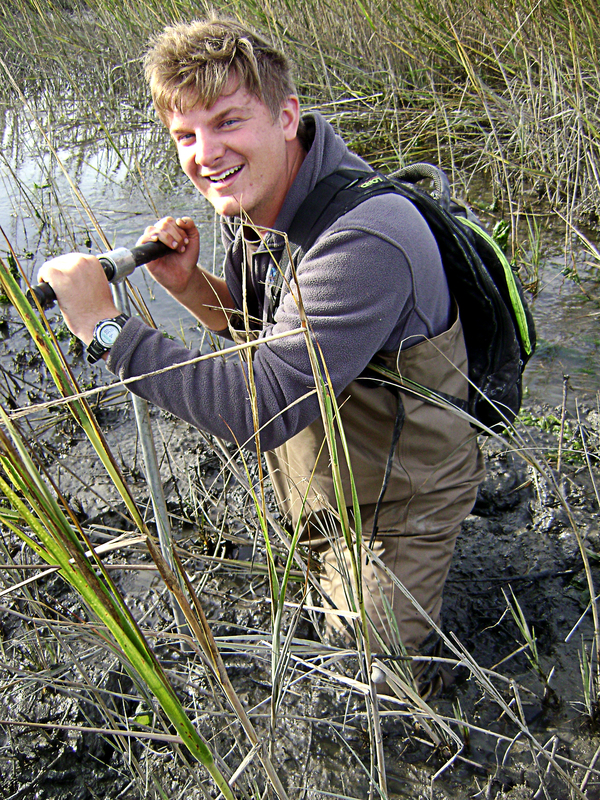 He studies the Virginia Barrier Island system, a chain of sandy islands along the coast of Virginia. Even though the barrier islands as we know them today have existed for thousands of years, the individual islands are in a constant state of change. Apart from the geologic features that can sometimes anchor an island in place, the islands’ movement can also be influenced by the amount of sand they accumulate, since more sand means more security against ocean waves. In the last 150 years, Assateague Island has accumulated more sand on its southern end than is found on all of the barrier islands south of it combined. As one island grows, others may be starved of sand and left more vulnerable to erosion. Often, islands with less sand move toward the mainland at a faster rate than the islands that are reinforced with more sand. Shawler will study sediment accumulation on Assateague Island at Fishing Point and the processes responsible for shaping this island—and subsequently, resolve uncertainty about how sand accumulation here will influence adjacent islands. “The secondary question that comes from that is what long-term changes are occurring in other parts of the barrier island system to the south,” Shawler explains. To answer this, Shawler will analyze the sediment record preserved beneath the surface of Assateague Island to learn how it has transformed over time. These sediment layers tell researchers about the different wave and wind conditions around the islands—all the factors Shawler will incorporate into the model he is using. Once the past relationship between historic conditions and sediment transport are clear, Shawler will be able to make predictions about how future processes—like sea-level rise or larger, more frequent storms—might shape the islands. Most of the sand that reaches Virginia’s barrier islands comes from sediment eroding off of coastal cliffs in Delaware or Maryland. The sand works its way south through what Shawler calls the long-shore transport system, carried quickly by storms, or gradually by waves, along the beach. The computer simulation will allow him to make projections about how the barrier islands might gain or lose sand under various conditions, like a continuation of the rapid sea-level rise that researchers have observed in recent years. Although a sea level increase of 1/5 of an inch per year may seem small, the change has a big impact on the barrier islands, which are unstable when water level changes. 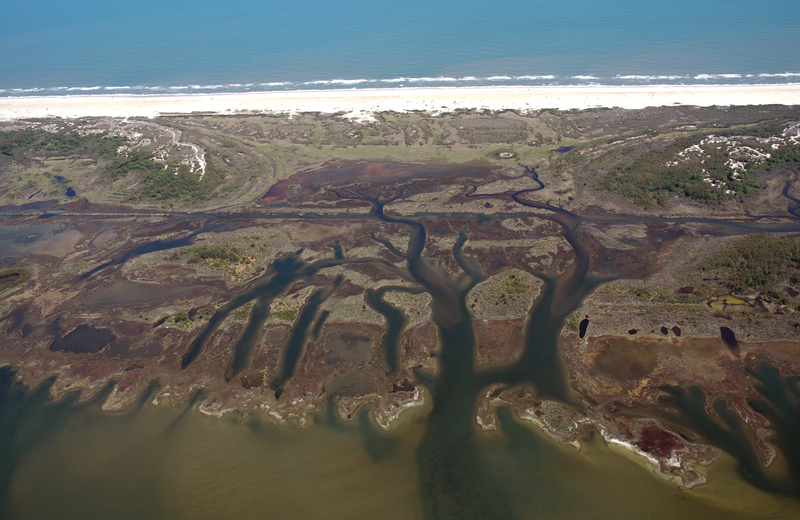 Over the past few decades, coastal researchers have observed rapid movement of the barrier islands toward the mainland shore, destroying the marsh habitats behind the islands. The islands have constantly changed throughout their history in response to the changing waters, so Shawler’s work will determine whether the rapid changes in the present day are more drastic than the changes in centuries past. “Some of them—Cedar Island, Wreck Island, Cobb Island—are starting to disintegrate and fall apart in places, and they can’t keep up with sea-level rise,” Chris Hein, an assistant professor at VIMS and Shawler’s research mentor, explains. Although the sediments in Shawler’s research cover hundreds of years of history, the projections about the future of the barrier islands will help policymakers and city planners along the coast make time-sensitive decisions—like where to place parking lots on the northernmost islands that are accessible by car. This kind of infrastructure is especially important for Assateague Island National Seashore, a stretch of the barrier islands that received more than two million visitors last year. Curt Smith, the Director of Planning for the Accomack-Northampton Accomack-Northampton Planning District Comission says hard-engineering approaches to fortify the islands are unlikely. Apart from Wallops Island, which is home to billions in NASA infrastructure, almost all of the islands are preserved in their natural condition by the federal government and The Nature Conservancy, including the public beaches that are open to tourists. The unique ecosystem and economic value of Virginia’s barrier islands has led the United Nations to designate them as an international biosphere reserve. Even though hard-engineering options like berms or beach nourishment are off the table, understanding how the islands might grow or shrink in the future will help policymakers start planning now. One of the main reasons that Virginia’s barrier islands grow or shrink is the amount of sand transported along their beaches by waves and currents. As northern islands like Assateague accumulate sand and grow wider, islands to the south are starved of sand, causing them to thin out and erode faster. Understanding how fast islands are growing and shrinking—and why—will help coastal planners protect the resources these islands provide. This story is the conclusion of a two-part series about VASG-funded research on Virginia’s barrier island system. For more background about the barrier islands, read part one of the series here. Shawler’s work will determine whether the rapid changes in the present day are more drastic than the changes in centuries past.